Daniel was great to work with, very eager to help, got me a good offer for my trade right away. The whole process start to finish was good, financing was very fast. The whole process was fast and easy. The experience I had was quick, fast, and easy! I have never been to a dealer ship that had my bedt interests at heart. I felt that I was treated like family. 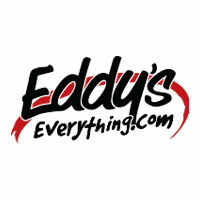 I would recommend any and everyone to Eddy's! Very good service, made appointment and was able to get my vehicle in early. Contacted me about recalls and helped me to get them scheduled. Also talked to me about some future recalls to be expected. Also communicated future maintenance to be expected. Superb customer service in the service department! Chad went above and beyond to help me and accommodate me, correcting the situation that occurred in the parts department that took place.I look forward to returning to Eddy’s for all my Jeep needs. Initially, there were issues getting my vehicle mx done. A bearded guy...didn't catch his name...turned us away...we rescheduled with mx approved by Dave...same bearded guy tried to turn us away the 2nd time but after we said that Dave had approved it and he verified...we were good to go. An acknowledgement or apology from the bearded guy would have been nice but in the end he came around and was more customer friendly. I really enjoyed the video text of the mx being performed, it was a pleasant surprise. I hope next scheduled mx runs smoothly since I would like to continue working with Eddy's. BIG shout out to Eddy's CDJR for all their help in getting my new transmission taken care of when it went out while I was in Wichita for my granddaughter's wedding and was 4.5 hours from home. Their ASM Chad was great and managed to get me a vehicle to get home in until my own car was fixed the next week. Thank you for all the work you did along with the Chrysler home office to get me fixed up and on the road again. If anyone is looking for a great service experience I highly recommend Eddy's Chrysler and if you are looking for a new auto I'm sure they are wonderful with their customers there in Wichita so give them a look you won't be sorry you did. If you need service go see them and they will make sure you get the great service you deserve and need. Thanks again Eddy's. They were very helpful and very courteous! They awesome & take very good care of me! Edited Review: Subaru has called me and was very apologetic for the inconvenience of my last appointment. They also offered me a free oil change and tire rotation for my next visit. I really appreciate the time they took to make-up for the disappointing time my family and I had to go through during our last appointment. Very pleased with the customer service given here. Thank you Subaru.Original Review: I’ve been here about 3 times and I always schedule an appointment for my oil change instead of just showing up because I don’t want to have to wait a long time. At my last visit I made an appointment for 11am. My husband and I, along with our kids, got there at 10:45am and didn’t get our vehicle back until almost 2pm. It was a horribly long wait and I had my 3 little kids with me so it was rough for them too. Then when they gave me my vehicle back the speedometer all of a sudden wasn’t working and it was working just fine prior to my appointment, plus this vehicle is brand new so nothing should be wrong with it. So I had to turn back around, come back to Subaru, and have them fix the speedometer. It was just a nightmare. To have to wait 3 hours for a simple oil change to be done is excessive and exhausting and honestly very frustrating considering the fact that I had a scheduled appointment. What’s the point of scheduling an appointment if you’re going to have to wait for hours anyways? Then to also have to turn around and come back so they can fix whatever they messed up with the speedometer was even more frustrating. And no explanation was given as to why it took so long or why the speedometer wasn’t working. Just overall a very disappointing experience. Very friendly, efficient and knowledgeable. Pointed out some warranty work he offered to do that we weren’t aware of. Highly recommend Scott Thomas and Subaru of Wichita. They had a “promotion” of a car for 99$ I was the first one to arrive at the dealership around 2 in the morning . I waited all night . While waiting to use the bathroom someone else got in line , I explained to the coordinator of the event I’ve been here since 2 but I had to use the bathroom . They persisted to let everyone in and let the people who came after me some time around 5 or 6 in the morning receive the promotion they then went on to explain to every person in line how it’s only one car per day, I guess because of the conflict and the proof I had showing I had been there all morning and way before the person in front of me they chose not to come over to talk to me I guess not wanting to know how I would take the news of waiting for 6 hours and then giving it to someone who only waited for 2 . I sat waiting for someone to come talk to me for about 30 minutes before I finally just got up and left The fact they didn’t have an explanation or an apology for me and my time wasted is beyond me and was completely poor managed if someone is waiting for something that long they shouldn’t be penalized for going to the bathroom . I am completely disappointed . My visit at Subaru Wichita for a recall issue on my 2013 Outback was a most pleasurable experience. All employees were quick to offer very good service and I left with complete satisfaction. I encourage others to trust and use Subaru of Wichita. Subaru is the best! I had a very good experience with my team! We fill we get the best offer after we were done. Thanks everyone for making it happen! Thanks to Nate and Tony there, I rode away with the car I had been wanting a day after my birthday. I wasn't in the market for a car, but after stopping in and speaking with them both, they worked out a deal for me that I could not pass up. The process was quick, easy, and very simple. I even got to drive the car home the same night and leave the car that I came with overnight until I could bring it home. They all get an 'A' in my book. The Service Manager Tony Dailey will always have our business! He is honest & trust worthy. Not to mention a really nice guy. He knows his stuff! No one ever likes to be in the service department. He has me smiling evertime I leave! Thank you Tony! Perfect customer service without ever walking in. Corresponded with me over text and phone since I live a bit far to get me the best price possible without being pushy. They really go out of their way to accommodate, shout-out to sales manager Tony. Would not go anywhere else for my next car! Had a great experience with Nate! Made sure my car was ready, trade in was easy, and the finance dept doesn’t push a bunch of stuff on you you don’t need. Highly recommended! I came to Eddy's Mazda on a whim. I have been searching for a used $4500 range vehicle to purchase for about three months before my Mazda. I had some pretty disappointing experiences and was feeling a little defeated as my Grand Am of 23 years old was a death trap. I was in Lee's Summit at another dealearship and was highly disappointed in the car we test drove. We went to eat as it was around 4 pm on a Monday. I find another used car only to find it was in Olathe. My boyfriend goes "you are not leaving Lee's Summit without a car are you? There are more dealerships up the road." We took a right and I turned into Eddy's. (I determined with all the cars I test drove, that I really wanted a Mazda 6). I had zero intentions on getting a brand new car and was dead set on used. Jordan made me feel extremely comfortable with my purchase of a "new" 2016 Mazda 3. (I will be getting 6 in the future from him). With my past three months experiences of car searching, I walked away from Eddy's with a way newer car. I could not have been more happy with the customer service from these amazing fellas at Eddy's. I LOVE LOVE LOVE my Mazda and I love the folks at Eddy's!!! The lord works in mysterious ways! I bought a 2016 Chevy Traverse. They were very professional & nice too. I am recently divorced and not the best of credit after all was said and done. Nate and Austin both helped finding the right car for both myself and my cousin. I wasn't really excited to go car shopping but they made it worry free as well as comfortable. I recommend them whole heartily, especially after reading these other reviews as I know they have a whole new team there. Did awesome work on my friends car. Although I have not visited this location, the people I spoke with over the phone were very helpful and answered all of my questions satisfactorily. I will be visiting them soon. AWSOME .... Best service ever.. LINCOLNTANNER YOU ROCK BUDDY..
Service was excellent! Last Friday my wife’s Navigator broke down. On top of that we were 400 miles from home. Tanner in the service drive went above and beyond to help with our situation. Would highly recommend using Tanner! Glad my former sales person is back! Low pressure sales and no nonsense offers on trade in. Quick and helpful salespeople and finance people. Adam and nick. Great experience as usual. This is my third new vehicle from eddies. There is a reason I keep coming back. Great dealership, very friendly staff and helpful. Highly recommend. Updated:I really want to thank Ashley Cummings for helping me. She is a customer service representative that saw we were having troubles with our car. The display/radio/navigation kept going in and out. After paying for them to look into it, I found out it is really expensive to get the unit replaced. I didn't even do anything to cause the malfunction with the device. Ashley read my review and she got right on the case. They fixed the issue at no cost to me, and even had someone come out to pick up the car to go get it fixed. Leesun was the one to offer that complimentary service. Monique Sherri also was very helpful who is from the corporate office. She and T.J. West (service manager) also worked to help me get this issue resolved. I really appreciate what they all did for me; it took a huge weight of stress off my shoulders. After being a customer since 2009, I am very satisfied with their service. They cared enough to listen and to resolve the issue. I recommend their services, and they have made me a very happy customer. Recently bought a Prius Orime at Eddy's Toyota. Fred did an excellent job! We had a lot of questions. He went out of his way to find the answers....Thank you Fred! Always fast and friendly service and they have a very nice clean shop. I don't have a Volvo but they take care of our routine maintenance through the Eddys maintenance agreement good at any Eddys. Great service and another Volvo added to the family. Thanks to all of the staff! Volvo's "Service Center" is wonderful. They are my car family. I love my Volvo and I love Eddy's Volvo center. Very Friendly, above & beyond level helpful. Took the time to give me great advice and tell me exactly what was going on with my car and even how I could attack the problem myself! They worked extremely hard to get me sent home with a car that I didn't think I would get! Would definitely recommend them to anyone. Ask for Mason because he made this whole car buying process super fun. Just two months after financing my vehicle, the check engine light has already come on. They lied to me when they said this vehicle wasn't a lemon. I'm beyond fed up with "super" car guys and recommend no one buys a vehicle from them! We were in on Saturday and drove home in a new vehicle! This is our 3rd time dealing with Super Car Guys and we have been happy each time. They always keep it honest, friendly, they explain everything in a way that anyone can understand. We worked with Mason and Josh, it was extremely busy but they always gave updates on each step of the process. They helped us and stayed with us the whole time and we were there until after closing hours! Very nice and professional! We said yes to getting our new car on Saturday, but they never make you feel obligated to say yes or do a deal that you are not 100% comfortable with. They offer refreshments and there is always popcorn! Super Car Guys rocks!!! They have great service, and will make sure that your getting into a vehicle that you love! They do not disappoint! Mason Davis is the man!!! Mason Davis is awesome! He and the rest of the staff made buying a car fun. They worked together to make sure we got the best deal on our car. My father and I went in looking to add a car to our household & ended up with 2 new vehicles. The whole process was unbelievable. The whole staff worked FOR US. We got financed with amazing deals and low payments. Special shout out to Angel and Cruz! They really listened to what we wanted and put us in the perfect vehicles!! This was by far the best car buying experience I've ever experienced! Anytime I know someone who's looking to buy another vehicle, I'm sending them to Super Car Guys West!!! Pay these guys a visit. I looked online for a bit before coming in so I had a good idea as to what I was looking for. Daniel Hernandez was the sales person, he was down to Earth and laid back. I had my 2y old niece and my wife with me. My niece was really good there and played some games they have. They also setup a place to Chrome cast so the little one didn't get bored. I really enjoyed the experience. Dalton was awesome and let us go on our own path at our own pace. But when we decided on a vehicle he went into "make it happen" mode. Matt, the finance guy was awesome too, smooth, not his first rodeo. Daniel H and Angel are amazing!!! We went in there with no down payment and no trade. Our credit is not good and walked out with an amazing vehicle. They did a great job!!!! My husband and I went to the weat store to buy a car we worked with Dalton and his team. They helped us and went out of their way to make sure we got the car we wanted and the payment we needed although we had poor credit they treated us with respect and worked hard to find us a lender. It was the best car buying experience i ever have had. Dalton was awesome he cared very much about helping us get into us into the exact car we wanted that dayEveryone there was super friendly and down to earth and easy to work with. Dont buy a new care with out going to super car guys west and asking for Dalton. Such a wonderful group to work with! It was a very busy Saturday. They were all running their tails off, but we were still made to feel helped and important to them. They took time to explain everything to us even though we ended up being in there very late in the day. The free lifetime warranty on all cars was a wonderful surprise. They worked hard to match us with the right lender. I cannot say enough great things about SCG from Brianna, Brandon, Devon & Matt. Thanks so much Guys! Friendly staff. Helpful as well. Our sales guy Dalton was just a pleasant young man and fun to hang out with. No pressure He let us decide what we wanted and then he went into "make it happen" mode. Matt, the finance guy, was a real pro. Smooth. Not his first rodeo. The rest of the SCG crew were all smiles and appear to genuinely like their job. I'll buy there again, for sure. Years ago, we had qualified with our credit, but our income was insufficient. But this time was different. God truly answers prayer. He sent the right people in our path to help us get into a set of wheels. We had just moved to Wichita a month ago, and I haven't even started my job yet. But my husband had his income for a long time. Our credit was at a medium level. They sat down and explained why we did not qualify for a no down payment even though that special is going on right now. You really need a credit score at a certain level to qualify for that. But, they were tenacious in getting us into a set of wheels. I was willing to take anything just to have a car to get to work. Jesse, Mason, and the rest of the staff were very courteous and very helpful. They got us down from needing $5000 down to $500 down and not all that was in cash. They had a creative way to come up with some of it since we did not have a trade in. They also worked with us hard on the financing to get a lower interest rate and lower payment than originally expected. It took us almost all day to get it but they worked that hard to help you get into a vehicle if you will work with them. Also, they were very understanding and helped us get something to eat and to get take us to get what we needed that was left at home to help get into the car. They even included in the financing some things that I would not have thought of like a lifetime warranty for major repairs and gap coverage. They did give us a CarFax report on the vehicle. The vehicle we ended up with was a 2017 model with only 43,000 miles on it. And, our first payment isn't until about a month away. These guys are awesome. So, if you are one who has been turned down by other companies for one reason or another, I would definitely give them a try. They will try their very best. They will work with you as hard as they can to get you approved. Mason was helpful and really diligent in getting me in a vehicle went above and beyond was very friendly to me and my family helped me get the most affordable vehicle and the best terms available will be buying my vehicles thru him everytime I'm in need of one. I got up Saturday morning bro to Wichita with all the intentions on coming back with a car that I wanted. The salesmen Jason,Jesse and Alex in the finance department did an amazing job on getting me the car that I wanted at the price that I wanted and I would go there again and again. Jacob Maxwell, Jerrett Gaddy and their manager Anthony made my car buying experience simple and got me approved for a better loan than I expected. You all are truly SUPER Car Guys! Great service, I got to meet Zachary. He is honest, friendly, patient and ready to help you make a good investment in your future car.